Near Schengen, on 14 June 1985, the picturesque town in Luxembourg, five European countries signed the agreement which led to the creation of Europe's borderless Schengen area. In light of mass flows of migrants seeking asylum in Europe, Hungary blocked migrants from onward travel to the rest of Europe and constructed a four-metre-tall fence along sections of the border with Serbia – a country not part of the Schengen area. 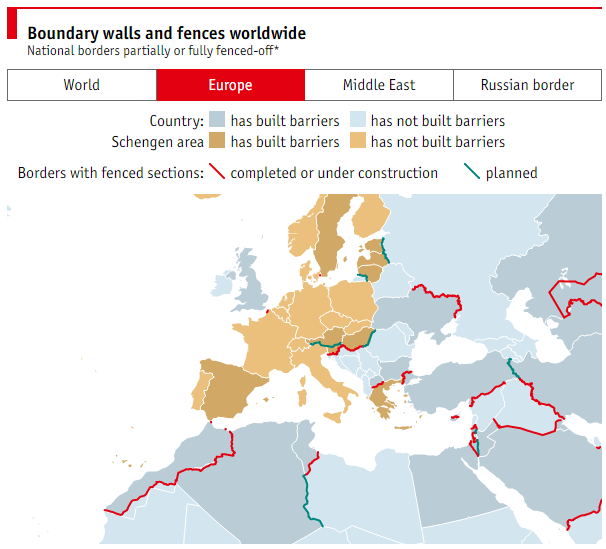 Also, Austria has begun building an anti-migrant barrier across the Brenner Pass at the Italian border. Putting an end to hope on one side and reducing fears on the other. However, it's not only in Europe that countries are raising the bar. US presidential hopeful Donald Trump wants to build a wall at the Mexican border. Increasing fear of terrorists in the US has led to the reintroduction of a visa for “certain Europeans“.